Unmatched technology means less guarding and dramatically better outcomes. The Hill DT spinal decompression table employs sophisticated load sensor technology which constantly measures and monitors the treatment force and patient-resistance of every treatment. At a rate of over 10,000 pulses per millimeter, the table senses the patient’s approaching threshold and reduces the pull, allowing the table to provide low-force, smooth decompression in a completely different class from cable-based systems. The HillDT table's technology means dramatically better outcomes because the patient experiences far less muscle-guarding than with other designs. In most cases, the patient is able to painlessly leave the table within seconds and with very little soreness to follow. Positioning a patient for a lumbar decompression treatment on the Hill DT spinal decompression table is simple and can happen in less than 30 seconds. The table has power elevation with a range of 26 inches to 35.75 inches, customized to your personal working height. Our signature Pelvic Flexi-Straps™ result in total encapsulation of the iliac crest, with the ability to widen for all body types. The adjustable matching flexion stool is included to flatten out the lumbar area. The pillow is used underneath the head and the thoracic harness gently secures the torso, creating a comfort level unmatched by any other decompression experience. The combinations of the pelvic tilt system and the eight treatment protocols on the Hill DT are also unequaled. Calculable and repeatable, professionals now have a unique opportunity to direct the force to the exact disc they want to target with absolute certainty. We were very mindful to focus on efficiency and safety when designing the Hill DT’s cervical decompression functions. Looking at the table, you might not realize it, but there are two distinct advantages built into our cervical decompression. The first is our unique cervical device that comfortably cradles the head with complete encapsulation of the occiput. Fully adjustable, cushioned and contoured, patients experience a customized support system that grants them total peace of mind. The second is the ability to tilt the cervical cushion of the table to target the lower discs. The tilt also functions to take pressure of the posterior disc region, especially in patients with a lot of posterior bone spurring that is encroaching the intervertbral foreamen (IVF). One glance at the Microsoft Surface Pro™ Tablet powered by Windows 8 will have your mind whirling with the possibilities. The 16:9 widescreen, ClearType full HD display with 1080p resolution is touch-sensitive and can be navigated quickly using the tap of your finger or the supplied digital pen. The 64 GB Anti-Shock Hard Drive and 4 GB High Speed Memory provide more than ample power to run the custom designed Hill DT Software. When in the right hands, it performs with amazing results. The versatility of the Surface also allows Doctors to connect to the internet, play videos and install any Windows platform applications, such as patient education applications. The Hill DT spinal decompression table comes installed with its own custom software. 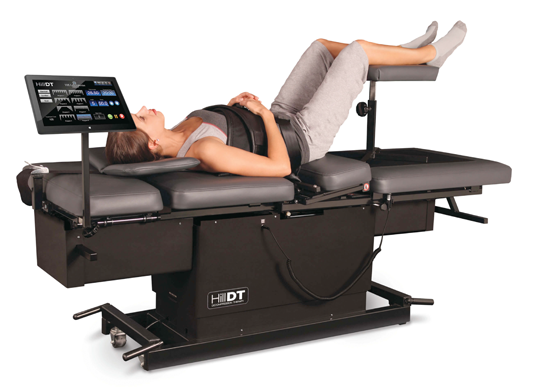 With the ability to control and change the table settings, including table height, treatment program, pelvic or cervical angle, decompression force and treatment time, the Hill DT application is versatile enough to accommodate any treatment protocol. Different symptoms require different treatments. That’s why the Hill DT software comes with two treatment types, a single treatment or a dual treatment. With the dual treatment option, you can pre-program two consecutive treatments, touch the run button, and let the Hill DT do the rest of the work. The Hill DT comes with eight treatment programs that are designed with efficiency and variety. Each program has their own characteristics and can treat any decompression candidate. It’s important to know what your equipment is doing during an automated treatment. The Hill DT Software brings that awareness and displays real-time streaming data of the treatment time, cycle time and decompression force. That way you know what is happening, when it's happening. The Hill DT software comes with a database application that can store a history of treatments. The database can be sorted by Doctor or Patient ID and transfered easily through a wireless network to your office computers, opening with any spreadsheet software. The Hill Decompression Table comes with a patient safety switch that immediately cancels the treatment if pressed. At the end of a treatment the touchscreen also has a built in audio speaker to alert the doctor or assistant when the treatment has ended. The Hill DT software can be remotely diagnosed and updated directly by our technical department through your Wi-Fi network. If there are updates or improvements made to the application, installation is fast and easy. 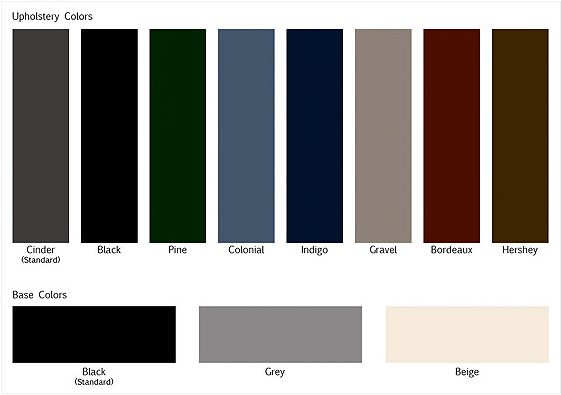 *Standard Hill DT colors are Cinder upholstery and Black. Any other color combination is available for an additional fee. *The colors reproduced here are subject to the limitations of your display and may therefore vary slightly from the actual table. The company reserves the right to alter or withdraw any color without notice. Our Outcome Assessments show we are helping herniated and degenerated disc patients at an awesome success rate. The Hill DT Spinal Decompression table gets results and I can't imagine practicing without it. - Randy Reed, D.C., C.C.S.P. What truly amazes me, is to see the transformation of a patient who starts off in pain, frustrated, and somewhat defeated. By the end of the HillDT program they are bright-eyed, full of energy and smiles. It doesn’t get any better than that. -Theodore J. Paquin B.S., D.C.